All transactions are safe and secure with a reliable history in online purchasing behind each of our associates. Buy the Hunger Games The Hob t-shirt to own Hunger Games clothing and merchandise. 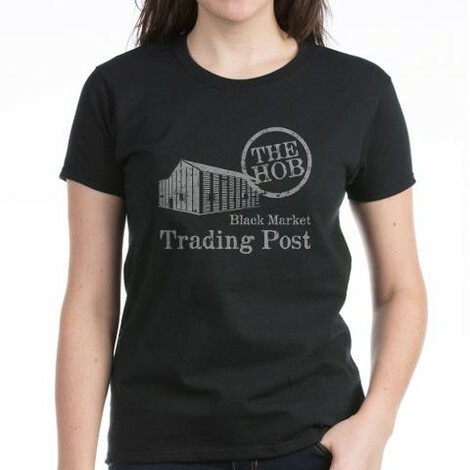 The Black Market Trading Post The Hob is featured prominently in Suzanne Collins' Hunger Games trilogy in both the first book and in Catching Fire, before it is incinerated by the Capitol. Well-known characters associated with The Hob include Greasy Sae, who operates a soup stand there. Wear The Hob shirt shown here or a Hunger Games Catching Fire t-shirt to promote the forbidden trading and activities that allow hope to catch fire in the hearts of the rebels. In addition to the Hunger Games The Hob tee above, browse the Hunger Games Clothing Gallery for more apparel like men's and women's clothes, kids shirts or hoodies.